To provide educational and participation aspects through the Heritage Circuit concept, a feeder system for the development of equine sports. To encourage interest in and to develop a grassroots level of officiating within the province. To enhance the image of the Manitoba Horse Council with the general membership by providing a program that is universally available to everyone – a “Sport for All” concept. Requiring that horses be treated with kindness, respect, and the care they deserve, and that they not be subjected to mistreatment. Ensuring that owners, trainers, exhibitors and their agents use responsible care in the handling, treatment and transportation of their horses as well as horses placed in their care for any purpose. Providing for the continuous well being of horses by encouraging routine inspection and consultation with health care professionals and competition/industry officials to achieve the highest possible standards of nutrition, health, comfort, sanitation and safety as a matter of standard operating procedure. Requiring owners, trainers, handlers and exhibitors to know and follow their sanctioning organization’s rules and to work within industry regulations in all equine activities and businesses. The standard by which conduct or treatment will be measured is that which a reasonable person, informed and experienced in generally accepted equine practices, would determine to be neither cruel, abusive nor inhumane. For more information regarding this program please contact John Savard, the Executive Director of the Manitoba Horse Council, at [email protected] or 204-925-5719. 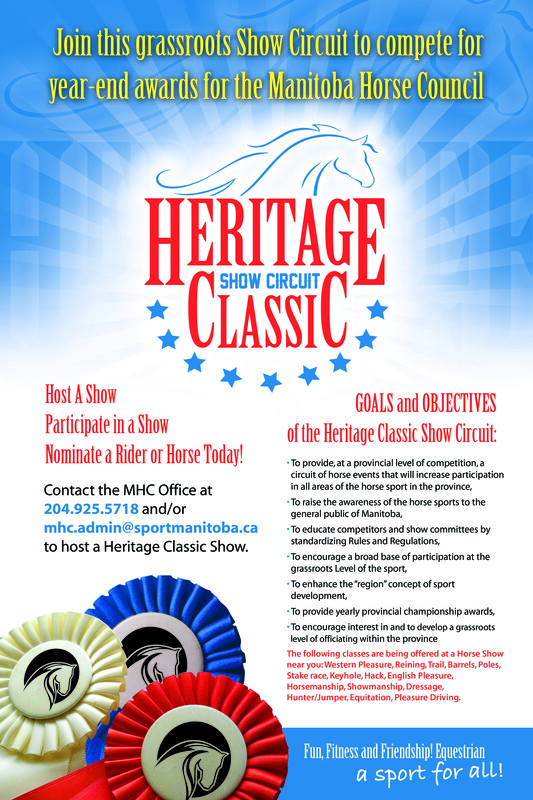 HERITAGE CLASSIC SHOW CIRCUIT - fun, fitness and friendship - a sport for all!